A theory of change describes how a program is expected to contribute to change and in which conditions it might do so i.e. ‘If we do X and Y, Z will happen because…’ Read more about the application of theories of change in development here. 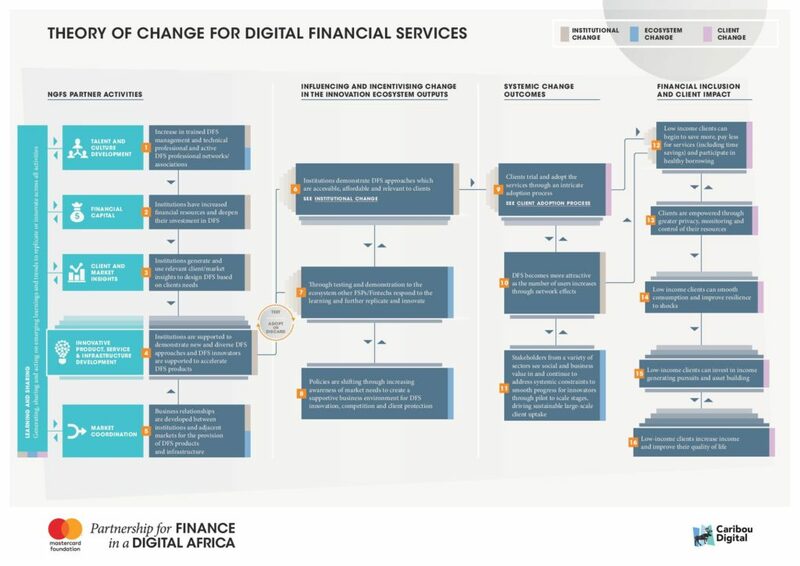 The Digital Finance Theory of Change is a set of hypotheses of how the partners can affect a variety of sequential and/or simultaneous changes within the Digital Finance ecosystem. Our approach focuses on six core activities that influence and incentivize changes in the innovation ecosystem. These are changes that support and encourage Digital Finance institutions and innovators to develop and deliver Digital Finance products and services that positively impact financially excluded, low income clients.